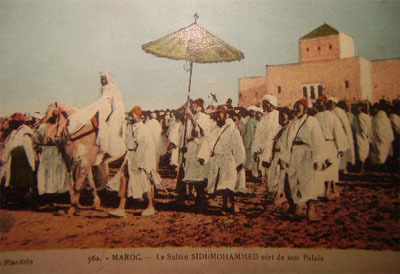 The Sultan SIDI MOHAMMED coming out from his palace. 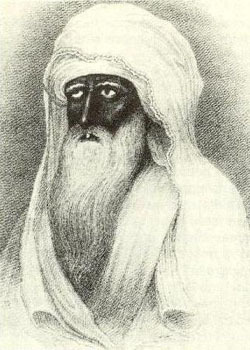 (Mohammed III , c. 1710-1790) was the founder of the new town Essaouira. Mohammed III revived the city of Essaouira and invited Jews and English to trade there. Merchants from Europe arrived and the city began to enjoy its golden age. The sultan decided to make it the most important port of the kingdom. He permitted different tribes to inhabit the city and consulates to be established: Denmark first, then France, Brasil and Portugal. This intelligent and tolerant sultan even welcomed an important Jewish community, which contributed greatly to the development of the city. 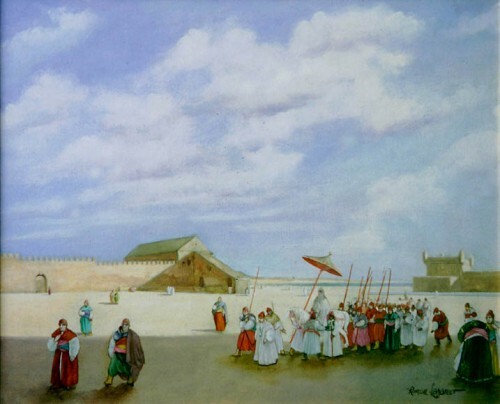 Mogador became the first Moroccan port to trade with the non-islamic world. In 1767, he signed a peace treaty with Spain and a trade agreement with France. 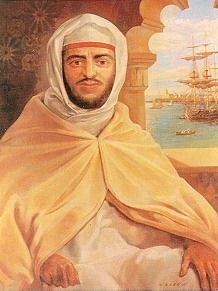 Under Mohammed III, Morocco became the first country to recognize the United States as an independent nation, in 1777. President George Washington wrote letters to the sultan in 1789 asking him for aid in allowing American ships to navigate nearby waters and thanking him for help with realease American sailors captured in Tripoli. It also became the destination for caravans bringing African riches from Timbuctu. The local Berber (Haha) and Arab (Chiadma) tribes provided labor for construction of the city but Then military contingents, including 'abîd al-Bukhârî (the Sultan's Black slave soldiers), and soldiers from Agadir, were permanently stationed there.These contingents account for the origin of three of the city's residential neighborhoods: Ahl Agadir, Bani Antar and Bouakhir. 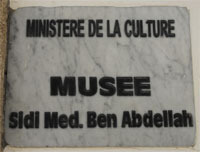 Mohammed III was a sultan Alaouite. Laâlouj in the Kasbah of the Medina. In 1787 the United States and Morocco signed a Peace and Friendship Treaty, the oldest in U.S. history. 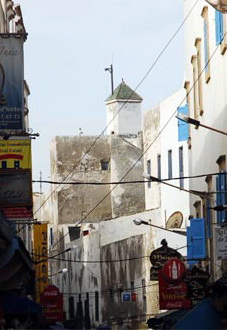 The typical 18th century tower (minaret) of the Sidi Mohammed Ben Abdallah Mosque, also known by the name The Kasbah Mosque. The dam "Sidi Mohamed Ben Abdellah"
The potential of the basin Oued Abiraqraq water is estimated at 680 Mm ³ and has the largest dam "Sidi Mohamed Ben Abdellah" put into operation in 1974.The raising of the dam Sidi Mohamed Ben Abdellah was the best solution for meeting the constant increase of water needs. With this raising it was possible to increase the dam height from 97.5 to 105 m and the storage capacity of 480-1025 Million m3. This operation required the establishment of 650 000 m3 of fill and 50,000 m3 of concrete.